The current report summarizes a protocol that can be utilized to model the influence of the bone marrow microenvironment niche on leukemic cells with emphasis placed on enrichment of the most chemoresistant subpopulation. It is well established that the bone marrow microenvironment provides a unique site of sanctuary for hematopoietic diseases that both initiate and progress in this site. The model presented in the current report utilizes human primary bone marrow stromal cells and osteoblasts as two representative cell types from the marrow niche that influence tumor cell phenotype. The in vitro co-culture conditions described for human leukemic cells with these primary niche components support the generation of a chemoresistant subpopulation of tumor cells that can be efficiently recovered from culture for analysis by diverse techniques. A strict feeding schedule to prevent nutrient fluxes followed by gel type 10 cross-linked dextran (G10) particles recovery of the population of tumor cells that have migrated beneath the adherent bone marrow stromal cells (BMSC) or osteoblasts (OB) generating a "phase dim" (PD) population of tumor cells, provides a consistent source of purified therapy resistant leukemic cells. This clinically relevant population of tumor cells can be evaluated by standard methods to investigate apoptotic, metabolic, and cell cycle regulatory pathways as well as providing a more rigorous target in which to test novel therapeutic strategies prior to pre-clinical investigations targeted at minimal residual disease. The overall goal of the method described is to provide an efficient, cost-effective in vitro approach that supports investigation of the mechanisms that underlie bone marrow supported survival of leukemic cells during chemotherapy exposure. It is well documented that surviving residual tumor cells that persist after treatment contribute to relapse of disease that is often more aggressive than that at diagnosis and is often less effectively treated1-8. Models that include leukemic cells in isolation, such as those limited to culture of cells in media alone, for testing of therapeutic approaches do not factor in these critical signals, or the heterogeneity of disease that occurs in response to availability of niche derived cues in which tumor cell subpopulations with very specific interactions with niche cells derive enhanced protection. Standard 2D co-culture models that co-culture bone marrow derived stromal cells and leukemic cells have somewhat addressed the contribution of the marrow niche and have shown that interaction with bone marrow microenvironment cells increases their resistance to chemotherapy and alters their growth characteristics9-14. These models however often fail to recapitulate long term survival of tumor cells and do not accurately inform the outcomes associated with the most resistant leukemic cell populations that contribute to MRD. In vivo models remain critical and define the "gold standard" for investigation of innovative therapies prior to clinical trials but they are often challenged by the time and cost required to test hypotheses related to resistant tumors and relapse of disease. As such, development of more informative 2D models would be of benefit for pilot investigations to better inform the design of subsequent murine based pre-clinical design. The 2D in vitro model presented in this report lacks the complexity of the true in vivo microenvironment, but provides a cost effective and reproducible means to interrogate tumor interactions with the microenvironment that lends itself specifically to enrichment of the chemoresistant subpopulation of tumor cells. This distinction is valuable as evaluation of the entire population of tumor cells may mask the phenotype of a minor group of therapy resistant tumor cells that comprise the most important target. An additional advantage is the scalability of the model to fit the analysis of interest. Bulk cultures can be established for those analyses requiring significant recovery of tumor cells, while small scale co-cultures in multi-well plates can be utilized for PCR based analysis or microscopy based evaluations. Based on this need we developed an in vitro model to address the heterogeneity of disease that is characteristic of B-lineage acute lymphoblastic leukemia (ALL). We demonstrate that ALL cells, which share many characteristics in common with their healthy counterparts, localize to distinct compartments of BMSC or OB co-culture. Three populations of tumor cells are generated that have distinct phenotypes that are valuable for investigation of therapeutic response. Specifically, we demonstrate that (ALL) cells recovered from the "phase dim" (PD) population of co-culture are consistently refractory to therapy with survival that approximates tumor cells that have not been exposed to cytotoxic agents. These ALL cells, from either established cell lines or primary patient samples, migrate beneath adherent stromal cells or osteoblast layers but can be captured following trypsinization of cultures and separation of cell types by utilization of gel type 10 cross-linked dextran (G10) particle columns15. Here we present a setup of a 2D co-culture that can be employed to model interactions between bone marrow microenvironment stromal cells (BMSC/OB) and leukemic cells. Of particular importance is the observation that leukemic cells form three spatial subpopulations relative to the stromal cell monolayer and that the PD population represents a chemotherapy resistant tumor population due to its interaction with the BMSC or OB. Furthermore, we demonstrate how to effectively isolate the leukemic cell populations by G10 columns. Of note, we have found that isolation of these subpopulations allows for downstream analysis of the most resistant PD population to determine potential modes of resistance that are conferred to these cells due to their interaction with the bone marrow microenvironment stromal cells or osteoblasts. Techniques that we have utilized downstream of this co-culture and isolation model include flow cytometric evaluation, proteomic analysis and targeted protein expression evaluation as well as more recently developed laser ablation electrospray ionization (LAESI) and Seahorse analysis to evaluate metabolic profiles. Through use of this model in combination with the techniques above we have found that the PD population of leukemic cells has a chemotherapy resistant phenotype that is unique when compared to leukemic cells cultured in media alone or those recovered from the other subpopulations in the same co-culture. As such, this model lends itself to more rigorous evaluation to test strategies targeting the most chemotherapy resistant leukemic cells which derive their resistant phenotype through interaction with the bone marrow microenvironment. Prepare G10 slurry by adding 50 ml 1x PBS to 10 g G10 particles. Mix by inversion and allow G10 to settle out of phosphate buffered saline (PBS) at 4 °C O/N. The day of G10 column separation, aspirate PBS from settled G10 particles and add 50 ml fresh PBS. Mix by inversion. Repeat twice, adding 50 ml fresh PBS to settled G10 particles and store at 4 °C until ready to use. Maintain both BMSC or OB at 37 °C in 6% CO2 and grown on 10 cm tissue culture plates until 90% confluency is reached. Trypsinize BMSC or OB cells and split 1:2 onto new 10 cm plates. The cells are grown to these standards until needed for leukemic co-culturing. Add 5-20 x 106 leukemic cells in 10 ml of tumor specific culture media onto an 80%-90% confluent BMSC or OB plate. NOTE: Our lab maintains co-cultures at 37 °C in 5% O2 to better recapitulate the bone marrow microenvironment which has been shown to range from 1% to 7%16-18 . However, maintaining co-cultures at this oxygen tension is not critical for the establishment of the three leukemic subpopulations and is at the discretion of the lab. Every 4th day remove all but 1 ml of media (including leukemic cells in suspension) and replace with 9 ml fresh leukemic culture media. When removing 9 ml of media from plate, be careful not to disturb the BMSC or OB adherent layer. Remove media by tilting plate to the side and aspirate media in the corner of the plate. Additionally, when adding fresh media, be sure to add drop wise in the corner of the plate against the sidewall to ensure minimal disruption of the BMSC or OB adherent layer. After the 12th day of co-culture, rinse leukemic cells from BMSC or OB layer by pipetting culture media from dish up and down gently over the dish approximately 5 to 10 times and then collect in 15 ml conical tube. Reseed onto new 80%-90% confluent BMSC or OB plate as described in step 2.1. NOTE: The gentle rinsing of the co-culture as described in step 2.3 will remove S and PB leukemic cells without disrupting the BMSC or OB monolayer. This allows only tumor cells to be transferred to the next co-culture plate. This 12 day cycle can be repeated as many times as needed based on user needs. NOTE: If sterile downstream analysis or culturing is required following G10 column separation the following steps should be carried out using sterile technique and G10 columns should be setup in a sterile biological hood. Pre-warm cell culture media to 37°C in water bath (~30 ml per column). Using a 10 ml disposable syringe, remove and discard plunger. Add glass wool to syringe. Using tweezers, pull apart glass wool into thin loose strands. Add multiple layers of lightly packed glass wool to the syringe until 2/3 of the syringe is filled with glass wool. NOTE: The glass wool is crucial to prevent loose G10 particles from contaminating the leukemic cell collection. Make sure glass wool is packed enough to support the G10 particles, but not too densely packed to block media flow through the column. Attach 1-way stopcock to the tip of the syringe in the closed position. Clamp syringe column to ring stand high enough so a 50 ml conical tube (collection tube) can be placed underneath stopcock. Place collection tube under syringe column. Using a 10 ml pipette add, drop-wise, G10 particles resuspended in PBS to the column on top of the glass wool. Continue adding G10 particles until a ~2 ml pellet (as measured by graduations on syringe) of G10 particles forms on top of the glass wool. Equilibrate the G10 column with pre-warmed media. Add 2 ml of pre-warmed media to column. Open stopcock valve slowly so that media flows out of the column drop-wise. Repeat step 3.6.1 until a total of 10 ml of pre-warmed media have been ran across the column. NOTE: If G10 particles are seen in the flow through in the collection tube, either 1) add more G10 particles to maintain ~2 ml pellet making sure no additional G10 particles escape from the column or 2) replace column with an unused one and repeat steps 3.4-3.6.1. After the pre-warmed media drains from the column, close the stopcock and discard collection tube with flow through. Add new collection tube under column. Column is ready to be loaded with media + cell mixture. NOTE: Columns should be used immediately and not allowed to dry. Collection of suspension (S) tumor subpopulation. Aspirate media from co-culture plate with pipette and gently re-apply the same media to rinse the plate and collect media containing leukemic cells in a 15 ml conical tube. The leukemic cells collected are the S subpopulation. Collection of Phase Bright (PB) tumor subpopulation. Add 10 ml fresh media back onto co-culture plate. Rinse vigorously by pipetting added media up and down approximately 5 times to remove adherent leukemic cells but not hard enough to dislodge adherent BMSC/OB component. Aspirate with pipette and collect media in a 15 ml conical tube. The collected cells are the PB subpopulation. Collection of Phase Dim (PD) tumor subpopulation. Rinse plate with 1 ml PBS to remove remaining media. Trypsinize co-culture plate with 3 ml trypsin and place into 37 °C incubator for 5 min. Remove plate out of incubator and gently tap sides of the plate to dislodge adherent BMSC/OB. Add 1 ml fetal bovine serum (FBS) and pipette up and down 3-5 times to break apart large cell aggregates. Collect media with cells in a 15 ml conical tube. These cells are the unpurified PD subpopulation with BMSC/OB as well. Centrifuge 3 isolated subpopulations at 400 x g for 7 min. Aspirate and discard supernatant then individually resuspend pellets in 1 ml pre-warmed media. Cells are ready to be loaded onto a G10 column. NOTE: Make sure stopcock is completely closed before adding media containing cells to G10 column. Also, each subpopulation must be ran over a separate G10 column so not to introduce any bias between populations in downstream analysis. Using a 1,000 µl pipette, add 1 ml of each cell subpopulation in pre-warmed media to a separate G10 column drop-wise. Ensure that the media containing the cells remains on top or within G10 pellet. Allow cells to incubate on G10 pellet for 20 min at RT. NOTE: Stopcock remains closed for duration of incubation. Add 1-3 ml pre-warmed media to each G10 column. Open stopcock valve and allow media to slowly exit the column drop-wise. NOTE: It is crucial to maintain a slow flow rate from the column or the G10 pellet containing BMSC/OB can wash out of the column and contaminate the isolated leukemic cells. Continue to add pre-warmed media in small increments (1-2 ml) to G10 column until a total of 15 to 20 ml has run through column and has been collected. Close stopcock valve and cap collection tube. NOTE: If a G10 particle pellet is seen at the bottom of collection tube, gently remove media from the tube leaving G10 particle pellet undisturbed and transfer to new tube. Centrifuge collected media at 400 x g for 7 min at RT. Remove supernatant and resuspend cell pellet in buffer appropriate for downstream application. Cells are now a pure population of leukemic cells free of BMSC or OB contamination and are ready to be applied to downstream applications at user discretion. NOTE: Leukemic cell viability should remain unchanged when passing cells through G10 columns. Successful setup and culture of this co-culture model will result in the establishment of 3 subpopulations of leukemic cells relative to the adherent BMSC or OB monolayer. Figure 1 shows how ALL cells seeded into a BMSC monolayer initially appear as only a single population of suspended leukemic cells. Over the course of 4 days leukemic cells interact with the BMSC to form 3 spatial subpopulations of leukemic cells (suspended (S), phase bright (PB), and phase dim (PD)). While the 3 subpopulations of tumor cells can commonly be seen after 24 hr of co-culture with BMSC or OB we co-culture the cells for 4 days to allow the full dynamics and interactions between the leukemic cells and BMSC/OB cells to take place before any manipulation or experimentation takes place (Figure 1). Also, note that we maintain the co-cultures at an oxygen tension of 5% to recapitulate bone marrow physiology, which has been reported to range from 1%-7%16-18. A vast majority of downstream analysis requires the separation of the leukemic cells from the BMSC or OB. To achieve this we use G10 columns to harvest a pure population of leukemic cells (Figure 2A). Following trypsinization of BMSC and PD REH cells a mixed population is seen by two distinct forward/side populations by flow cytometry (Figure 2B, top panel). Following G10 separation a pure population of only REH ALL cells is recovered, which was confirmed by forward/side scatter flow cytometry (Figure 2B, bottom panel). Use of this co-culture model and the ability to isolate leukemic cells from 3 subpopulations when in co-culture with BMSC or OB allows for interrogation of leukemic cell phenotype with relation to its spatial location relative to the adherent BMSC or OB monolayer. Of particular interest, is that ALL cells recovered from the PD population of a BMSC or OB co-culture have little to no cell death following exposure to cytotoxic chemotherapy (Figure 3A,B). Figure 1. ALL cells in co-culture with BMSC or OB form three spatial populations. Our lab uses an in vitro co-culture system to model leukemic cell interactions with bone marrow microenvironment derived stromal cells (BMSC or OB). To establish co-culture, leukemic cells (Red) are seeded onto an 80%-90% confluent monolayer of BMSC or OB (Blue), which is denoted as 'Time 0'. Co-cultures are maintained at 37 °C at 5% oxygen to approximate conditions of the bone marrow microenvironment. Leukemic cells will begin to form 3 subpopulations as early as 24 hr, but to allow for complete interactions to form we allow co-cultures 4 days to establish before utilizing leukemic cells for experiments. By day 4 (right panels), three subpopulations of leukemic cells will form in relation to the adherent monolayer. The schematic (top right) and the phase contrast microscopy (bottom right) show the suspended (S) leukemic cells freely floating in the media; phase bright (PB) leukemic cells which are adhered to the surface of the BMSC or OB monolayer; and the phase dim (PD) leukemic cells that have migrated beneath the BMSC or OB monolayer. Scale bar represents 10 microns. Please click here to view a larger version of this figure. Figure 2. Use of G10 columns allows for separation of ALL cells from BMSC/OB. 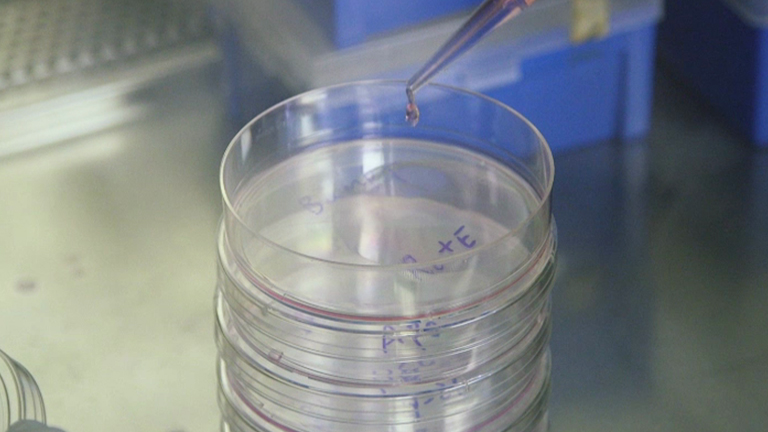 (A) Demonstration of the process of using a G10 column to separate ALL cells from BMSC/OB co-culture to achieve a pure population of tumor cells for downstream analysis. From left to right, a mixture of ALL cells and BMSC/OB cells is added to the top of the G10 column; (Center) cell mixture will settle in the G10 slurry and should be incubated at RT for 20 min (Note: Stopcock is in the closed position throughout first two steps); (right) leukemic cells are recovered by opening the stopcock and rinsing column with pre-warmed media. (B) Top panel shows before G10 separation that there is a mixed population of cells containing BMSC (blue gate) and REH ALL cells (red gate) by evaluating forward (FSC) and side scatter (SSC) analysis. Bottom panel, following G10 separation only the pure population of REH ALL cells (red gate) remain with less than 1% stromal cell contamination (blue gate). Please click here to view a larger version of this figure. Figure 3. PD leukemic cells have increased resistance to chemotherapy exposure. SD-1 leukemic cells recovered from the PD population of a BMSC co-culture (A) do not display reduced viability following a 4 day exposure to Ara-C [1 µM], MTX [50 µM], or VCR [25 µM], similar to untreated controls (note that a second dose of Ara-C added at 48 hr to account for any drug loss due to stability). Leukemic cells from the media alone, S, and PB populations have significantly reduced viability as determined by trypan blue exclusion.SD-1 leukemic cells co-cultured with OB cells display similar trends in viability (B). Results are expressed as mean ± SEM. (*) denotes p < 0.05, unpaired t-test relative to untreated controls. Please click here to view a larger version of this figure. Minimal residual disease (MRD) which contributes to relapse of disease continues to be a major clinical challenge in the treatment of aggressive refractory ALL, as well as, a host of other hematological malignancies. The bone marrow microenvironment is the most common site of relapse in ALL3,8. As such, models that model the bone marrow microenvironment are vital tools to test hypotheses related to leukemic tumor cell survival and maintenance of MRD during chemotherapy exposure. While mouse models define the gold standard for testing questions related to drug efficacy, 2D co-culture continues to be a cost effective methodology for testing hypotheses and drug strategies related to bone morrow microenvironment support of leukemic cell survival. Many groups have shown that co-culture of leukemic cells with BMSC or OB provides a survival advantage when challenged with chemotherapy agents9,10,12-14,19-21. Work modeling normal immature CD34+ hematopoietic cells in co-culture with mesenchymal stem cells (MSC) revealed that hematopoietic cells will interact with the adherent monolayer of MSCs to form three distinct spatial populations of hematopoietic cells22,23. Proliferation and differentiation of the CD34+ cells was effected relative to their location within the co-culture22. We have expanded on this observation to test questions related to bone marrow microenvironment stromal cell support of a resistant population of tumor cells within a 2D co-culture and its isolation for downstream analysis. Unlike standard 2D co-culture models which typically sample leukemic cells by removal of the suspended tumor, our model shows that co-culture represents a more dynamic interaction in which leukemic cells in co-culture with BMSC or OB form three subpopulations relative to the BMSC or OB monolayer (Figure 1). The tumor subpopulations that form are suspended (S) tumor, which is freely floating in the media; phase bright (PB) that is adhered to the surface of the BMSC or OB; and the phase dim (PD) which have buried beneath the BMSC or OB monolayer (Figure 1). In this model, we found that a strict feeding and reseeding schedule is important to achieve consistent results in a co-culture model and therefore we feed the co-cultures at 4 day intervals and transfer tumor to new BMSC or OB monolayers every 12 days. This may require modification for alternative tumor types as needed. The number of tumor cells that will migrate below the BMSC or OB to form the PD population may vary between different leukemic cells. This can be a limitation of the model, when the number of PD tumor cells are low making it difficult to collect enough cells for downstream analysis. In some cases this problem can be overcome by establishing replicate co-cultures to allow for pooling of the three individual subpopulations. As this model relies on tumor cell interaction with the BMSC or OB it is important to have an effective method to remove stromal cell contamination to address specific biology of the leukemic cells. To accomplish this separation of tumor cells from stroma we use G10 columns. Proper setup and use of these columns is crucial for isolation of pure tumor populations for downstream analysis. As highlighted in Figure 2B, proper execution of the G10 column separation results in recovery of tumor cells at greater than 99% purity. This allows for downstream analysis of the leukemic cells without complication of interpretation of results that would result from stromal cell contamination. It is important to note that all leukemic cell types whether cell lines or primary patient samples will vary slightly in their ability to pass through the G10 columns. Before use in large scale experiments users should determine the number of leukemic cells they must input to recover the desired amount needed for their specific downstream needs. In addition, the amount of wash media ran over the G10 column post incubation can be increased to try and increase the number of cells recovered. Care should be taken to insure that the additional washes do not cause stromal cell contamination which can be determined post wash by cell counts or flow cytometry analysis of flow through. In establishing this model, we observed that leukemic cells recovered from the PD population have increased viability compared to leukemic cells grown in media alone, as well as to those recovered from the S or PB populations in the same co-culture when exposed to cytotoxic chemotherapy (Figure 3 A-B). This is significant because it represents a population of leukemic cells in vitro that derive pronounced protection from chemotherapy. This provides a useful tool to test treatment strategies aimed at targeting the most resistant tumor population, which is supported by the bone marrow microenvironment. Furthermore, because these leukemic cells are so well protected by the BMSC or OB co-culture it is amenable to in vitro combination treatment strategies, that in media alone or standard co-culture models would appear to or would completely kill the tumor which is not always representative of effects seen in resistant microenvironment supported leukemic populations. Finally, we believe that use of this model can provide valuable insight into the interactions between BMSC/OB, and leukemic cells that are responsible for resistance to chemotherapy treatment, lead to MRD, and subsequently relapse. This model provides an in vitro platform to design experiments which will better inform downstream pre-clinical models. Though we show use of this model to test interactions between bone marrow stromal cells and ALL derived leukemic cells, we are hopeful that future directions and applications of this model will be useful in a variety of malignancies in which the bone marrow microenvironment provides a site of sanctuary for tumors during chemotherapeutic intervention. Supported by National Institutes of Health (NHLBI) R01 HL056888 (LFG), National Cancer Institute (NCI) RO1 CA134573NIH (LFG), P30 GM103488 (LFG), WV CTR-IDEA NIH 1U54 GM104942, the Alexander B. Osborn Hematopoietic Malignancy and Transplantation Program, and the WV Research Trust Fund. We are grateful for the support of Dr. Kathy Brundage and the West Virginia University Flow Cytometry Core Facility, supported by NIH S10-OD016165 and the Institutional Development Award (IDeA) from the NIH Institute of General Medical Sciences of the National Institutes of Health (CoBRE P30GM103488 and INBRE P20GM103434).